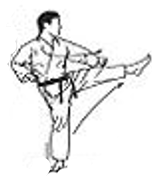 Bunkai is the process of analysing a kata to try to work out the meaning behind the movements. It is very much a skill in it's own right and there are some very useful books which can help with the process. Things which need to be taken into account when looking at kata are the angles of the movements within, as described by Kenwa Mabuni, the Structure of kata as was described by Seikichi Toguchi and as we now understand from historical Chinese martial arts forms. But also the nature of postures or kamae within kata. It's very easy to be be blinded by convention and see blocks and punches where none exist. 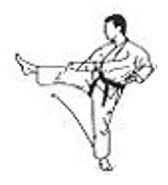 Obviously the first movement in a kata is also likely to be the first movement within a sequence and the end of the kata also marks the end point of the last drill sequence. Another way to determine a start/end point is where the creator of the kata runs the same sequence to both the left and right hand side. This gives you the the start/end of those mirrored sequences, but also the end point of the previous sequence and the start of the following sequence. The first two sequences which run left and right can be delimited as drill sets, and the empi based sequences also are performed to the left and right so they can also be delimited as drill sets. What this means then is that the juji-uke and morote-uke sequence in between these must also be at least one drill and could in theory be two, however given the shortness that is unlikely. Sometimes there are hints, such as kiai points. These often coincide with the end point of a sequence. Previous teachers having found them and inserted kiais for emphasis. Not all variants of a kata have kiai points, so it can be useful to look across all styles. Also you will sometimes find longer pauses between movements in some styles variants of katas, this can also sometimes indicate a start/end point, again these are not consistently used across all variants so it's worth looking at several stylistic performances. Some movements if performed against an opponent are highly likely to incapacitate him. Examples include movements that are obviously empi strikes to the head. These will also often mark end points to a sequence and the start of the following one. As Kenwa Mabuni says, the angle that the kata shows is the angle which should be taken with respect to the opponent to complete the techniques successfully. If the kata turns 90° to the left and then runs through the drill then the drill probably expects you to be on the left side of the opponent. The angles in kata appear to generally have a resolution of around 45°. Kata then represent a Copernican model of movement, with the opponent at the centre and you moving round him to an angle when the line of performance of the kata changes direction. However this applies primarily to the initial movement within a drill sequence; it is the initial angle of attack. The subsequent movements may include throws, take downs, trips etc which require you to turn with the opponent to unbalance him and bring his body with you, so within a drill sequence the angle of attack given by the kata would not be directly relevant to positioning with respect to the opponent. Instead the changes in direction represent real changes in direction. When you begin the kata, the opponent usually starts in front of you. In this example the line of performance turns 90° to the left, and the opponent remains approximately in front of you. Your body may be at an an angle, depending on exact stance and the technique that is being employed. However, after this point the opponent may be manipulated by the kata into different positions, some of which may even be behind you. In this sequence from Pinan Shodan, movements 7-9 the kata shows the practitioner facing to the rear of the practice area, this indicates that you are moving round to the rear of the opponent. In practice it is a combination of your movement combined with the movement of the opponent against the pressure of the arm bar which is being applied which moves you to his rear. He remains in front of you, but facing away. 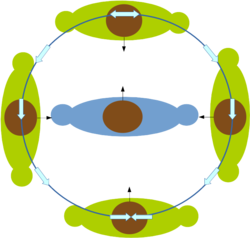 One of the problems of the Copernican model which kata apear to make use of is that representing the position of the opponent when he is not in front of you is problematic. e.g. being attacked from the rear. 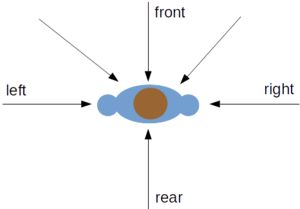 Also normal 180° changes in direction of the kata can be a problem. Are you simply changing direction to fit inside the practice hall or are you positioning yourself behind the opponent? Typically, the head always looks at the opponent, so head turns indicate changes of direction or angle compared to the opponent, most commonly at the beginning of a drill sequence. Unfortunately, this is not a very consistent indicator across katas and styles of karate, some styles apply it more consistently than others, and sometimes the head turns are not the same between styles. It's well worth watching head movement in versions of a kata other than your own. What about when the head does not look in the same direction as the obvious line of performance of the kata? Special attention should be paid to portions of kata where the head isn't looking in the same direction. In general the head looks at the opponent. It's also worth watching the head position when there is no obvious line of performance, such as when the movements are done while stationary. Naihanchi is an example where in most versions at certain points there are several turns of the head in conjunction with rotation, but no definite directional movement. It may indicate moving round the opponent to the desired position. Finally, the head often moves when one drill ends and the next begins, to indicate the position of the new opponent. One of the things that you find with the Pinan katas and perhaps with others is that the creator often runs a common sequence to the left and right, In addition to this, the following application which is done to the front is often of the same type or genre of application. E.g. If the left and right applications in the kata are elbow breaks, the application of the sequence to the front is sometimes (but not always) of the same type. i.e.a variation on the technique done to the left and right which should work when face on to the opponent. The nature of the drill sequences which were incorporated into kata would leave the opponent in such a situation that he is unable to continue to be an immediate danger. There are many ways to achieve this from breaking bones, joints, choking him unconscious, throwing him to the ground or simply restraining him. At the end of each sequence, bunkai or oyo, the opponent should be rendered incapacitated or unable to function and no longer a danger. Due to the nature of kata and the relatively small modifications which the various styles of karate have made to their versions, any application should really be valid across all variants of the kata. It's definitely worth watching how other styles than your main one perform theirs and compare if your application would be valid for all. This page was last edited on 23 January 2017, at 22:38.